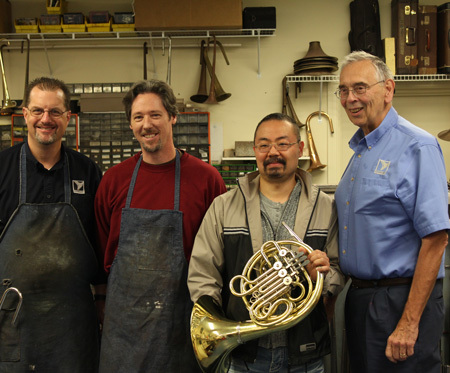 Jim Becker, Jim Engele, Katsushi Sakaino, and Bob Osmun check out the new Kruspe “Horner Philadelphia” model double horn. This morning, Osmun Music welcomed Katsuchi Sakaino, the owner of Ed. Kruspe Metallblasinstrumente. Mr. Sakaino is in the US showing his new horn to interested players and dealers all around the country. The firm Ed. Kruspe has been in existence since 1833. It was bought by Katsushi’s father Tatehiko in 2012 and they continue the tradition, building all brass, with an emphasis on horns, in their workshop in Bavaria. You can read about the history of the company on the Kruspe website. The new Kruspe “Horner Philadelphia” horn is a direct descendant of the horn Kruspe developed for legendary Philadelphia Orchestra hornist Anton Horner, in 1904. The Horner model was the first successful wide taper horn and was a big part of the “Philadelphia sound” made famous by Stokowski. In the late 1930’s it was copied by Conn and became the Conn 8D. Contact the shop if your interested in more information, and be sure to check our new and used horns, accessories, and mouthpieces at osmun.com.